The Consulate General of Israel - Los Angeles, participating for the second straight year, is the only foreign governmental agency among this year's LA Times Festival of Books sponsors. The organization's participating sponsor listing in the Festival of Books supplement that appeared in the April 18, 2010 edition of the L.A. Times states that, "The Consulate works to bring Israel to a variety of public stages through education, creativity, and passion . Israel cares about the community, Israel cares about you, and we are here to show it." The Consultate booth, located at #328 in Festival Zone C, will feature games and each winner will receive Israeli candy, CDs, t-shirts, books, an iPod, or a free flight to Israel. Hasbara materials and Israel tourism information will also be available. 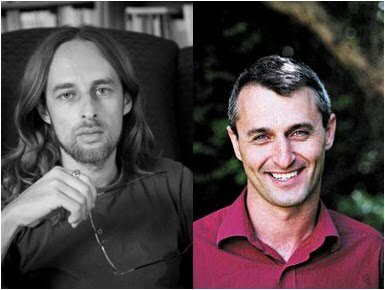 This year, three leading authors from Israel -- Alex Epstein, Assaf Gavron, and Eshkol Nevo -- will take part in various programs over the weekend. 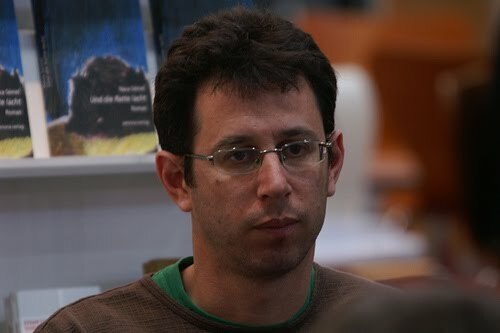 On Sunday Assaf Gavron (pictured at right) who most recently authored the novel Almost Dead, will be on the Festival's panel "Writing The Personal, Writing the Political" with two other authors. The discussion takes place from 10:30 am - 12:30 pm at the Fowler Museum Lenart Auditorium, followed by Gavron's appearance at Booth #328 from 1 pm - 3 pm. Pictured left to right, are authors Alex Epstein and Eshkol Nevo -- both of Israel -- who will also appear at the Festival. Epstein's recently published book, Blue Has No South, is a collection of short stories, while Nevo's newest 2010 title is the children's book Amalia's Father Goes to Australia. FTC Disclosure: MommyBlogExpert is covering the Los Angeles Times Festival of Books for this blog. MommyBlogExpert did not receive any payment or other compensation associated with this post. See complete FTC Disclosure information that appears at the bottom of MommyBlogExpert's main page and at the bottom of every individual post on this blog, including this one.